A healthy blood sugar is directly and intimately tied to, arguably, every part of your health and well-being. When your blood sugar is balanced your quality of life is vastly improved. If you are struggling with insulin resistance and many of the health issues associated with it such as prediabetes, diabetes, and metabolic syndrome, fluctuating blood sugar levels may be dominating and affecting your health and wellness. Managing normal blood sugar levels can be challenging as they often lead to complications including weight gain, sugar cravings, and fatigue. 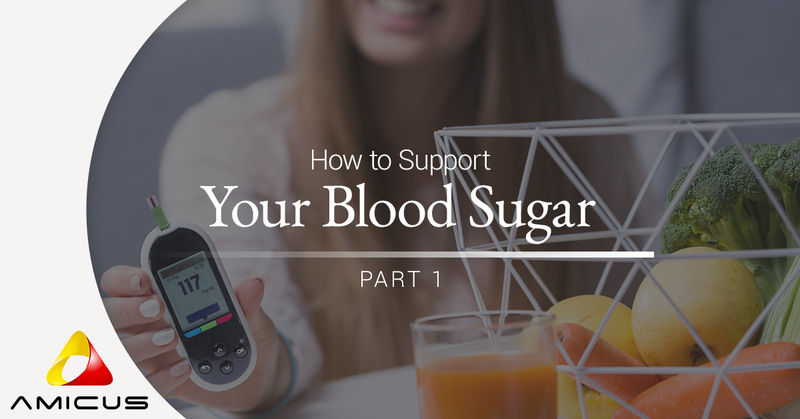 Avoid dangerous blood sugar swings and begin to make changes to support healthy levels. At Amicus, we have a beautifully-balanced herbal supplement, Sugar Check. Sugar Check differs from other products on the market in that it doesn’t try and jam-pack every trendy herb in it. Instead, it has a few chosen herbal powerhouses to help support your blood sugar. Learn practical ways to better balance your blood sugar and feel better. Blood Sugar, Why Be Concerned? As alluded to above, blood sugar is one of the largest parts of our health and wellness. When it is at alarming heights it impairs our body’s ability to fight and ward off illness and disease, affects our major organs including the heart and brain, and impairs our ability to move and be active. Glucose (sugar) raises blood sugar levels by eating a variety of foods that contain carbohydrates. Traditionally, we recognize blood sugar levels reliant upon the food we consume, but other factors play a role including stress levels. When we’re highly stressed our bodies release cortisol which impacts how insulin is released and used. There are a handful of lifestyle habits that you can incorporate to support your blood sugar. Small changes can make a huge impact on maintaining these levels. Read below for tips and ideas to get back on track, for reaching, and maintaining better blood sugar levels. Pro tip: Don’t overthink what you are doing. Often times the media comes out with articles on diet tips on the micro level — things such as what time you should stop eating or the best type of food to eat in the morning. While it is perfectly fine to pay attention, focus on the macro things you can be doing. Eat healthy and nourishing foods at every meal and get plenty of movement — start there and tweak things as you progress in your healthier lifestyle. Sugar nourishes your body, said no one ever! Everyone, whether you’re struggling with blood sugar balance or not, should make efforts to limit their sugar. Begin by moving from a processed diet full of drive-thrus and boxes to food that actually spoils! Work on getting as many whole foods as you can — eating macronutrients such as protein, healthy fats, and fiber with carbohydrates (compounds that rapidly digest to glucose and raise blood sugar levels) slow the absorption of glucose and can improve your appetite and better manage cravings and satiety. Breakfast – Eggs cooked in coconut oil, grass-fed butter, or ghee sauteed with veggies. Add a couple slices of avocado with a side of kimchi or sauerkraut. Lunch – Shredded chicken over a bed of greens or rolled up in a coconut flour tortilla — add your favorite dressing or sauce, but ensure there is no sugar added. For a side eat a couple of nuts and fresh fruit. Dinner – Eat pasture-raised steak with green beans and a sweet potato. Blood sugar impacts our health in so many ways and when it goes unchecked it can lead to a host of health concerns that can alter your quality of life. 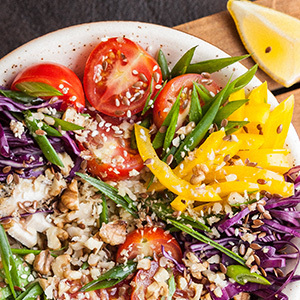 Eating the right foods is just the beginning in managing your blood sugar. Stay tuned for part two where we explore other factors that play a role in blood glucose modulation. To find additional resources on blood sugar support or to get started with Sugar Check, connect with us today!